Meghan is a Level 5 Certified Instructor through Romana’s Pilates. 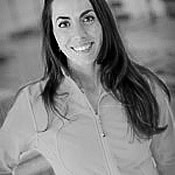 She completed her certification at True Pilates NY in NYC (formally Drago’s Gym) in 2005, and has attended annual Romana’s Pilates Conventions in Paris, Las Vegas, New Orleans, NYC & FL and frequent continuing education seminars at True Pilates NY. She owns Reform. A True Pilates Studio in downtown Saratoga Springs. Meghan graduated with Honors in Dance Performance and Choreography from Skidmore College in 2002 and joined the faculty in 2005.